Relax, enjoy and connect with friends, neighbors and nature at the Copperleaf Arboretum and Pool. 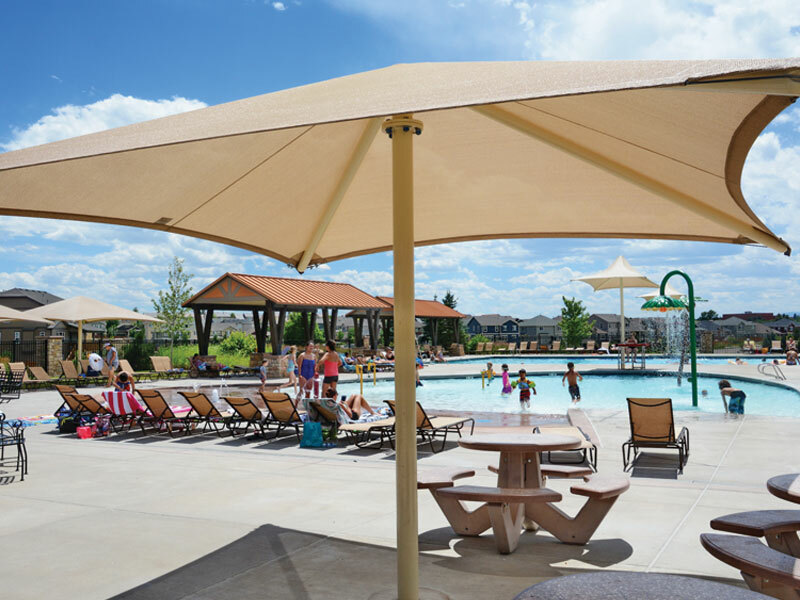 Situated on more than four acres within the heart of the community, the Arboretum Pool & Clubhouse is a great place to escape from the hustle and bustle of daily life and enjoy time with friends, family and neighbors — year-round. As you’ll discover, there’s something for just about everyone to enjoy, whether you’re looking for a refreshing dip in the community pool, a pick-up game with friends on our Sports Court or a great place to get together with family and friends on special occasions - or any other day. Lap Pool: This six-lane, competition-size lap pool is open to teens and adults. 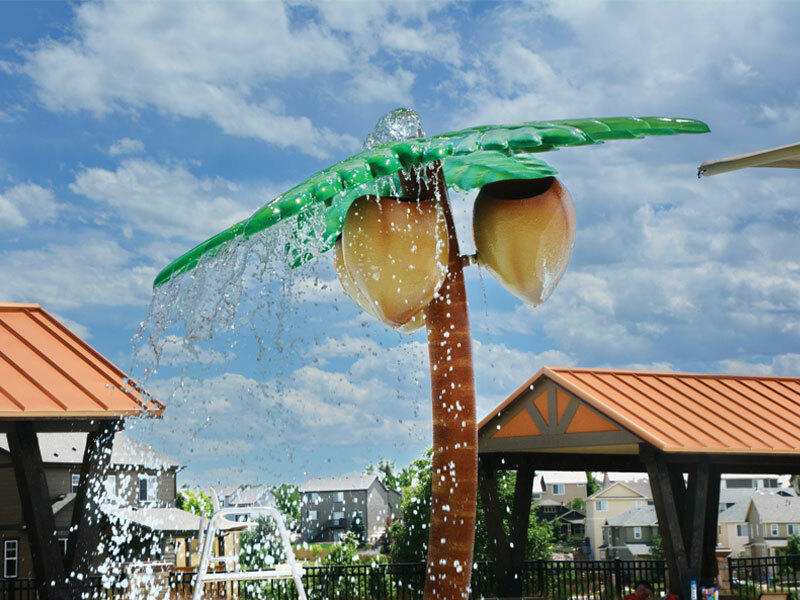 Splash Garden: Perfectly suited for the younger crowd, this fun-sized pool includes water toys, oversized play features and spray guns as well as a kid-friendly design that includes a “zero-entry” edge. Overlook Terrace: Provides ample shade and sunbathing spots throughout its spacious concrete decking. Pool House: Located adjacent to both pools, this convenient amenity houses changing rooms with showers and a first-aid station. 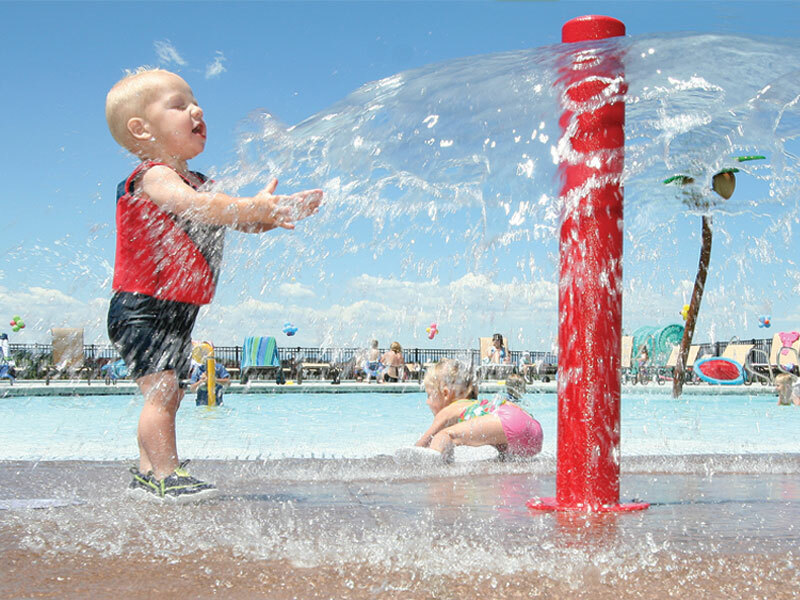 Toddler Playground: Located just outside the pool area, a convenient “tot lot” with built-in shade structure features plenty of fun, kid-sized equipment for your little ones to enjoy. Sports Court: Just a little ways further, bigger kids and adults can enjoy a little friendly competition on this expansive activity area, which includes a half hockey/half basketball court. The Clubhouse: This exceptional structure combines Colorado comfort with functional and exquisite design details, including stained concrete flooring, wood-beamed ceilings and centerpiece indoor/outdoor fireplace crafted with rich stone detail. Ideal for entertaining friends and family for birthday parties, anniversaries and other special events, the Clubhouse can be reserved by residents year-round for special celebrations, meetings and get-togethers. Simply click on CopperleafHOA.org/arboretum.php to download the Arboretum Clubhouse Rental Agreement. Landscaped Grounds: As its namesake suggests, the Arboretum will be home to a variety of trees and other greenery as well as beautiful community art. In addition to the fabulous facility, the Copperleaf HOA is known for hosting some of the best events and programs available. Here is just a sampling of what you can expect to find happening at the Copperleaf Arboretum in any season. Seasonal parties and celebrations that are unique and fun – including a not-to-be missed Halloween party for the kiddos, a Mardi-Gras event for the adults and the best holiday party for all – including visit from Santa AND the Grinch. Active April – A month full of ways to get and stay healthy and fit. 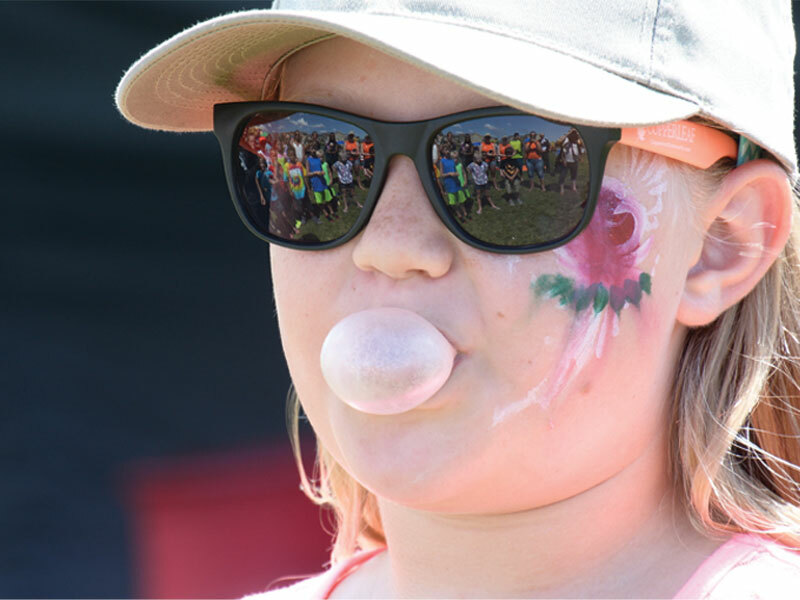 Copperleaf Summer Jam – An annual summer event and concert hosted in the Western Park that features food, family activities and live musical entertainment. A wonderful way to enjoy the summer at Copperleaf. 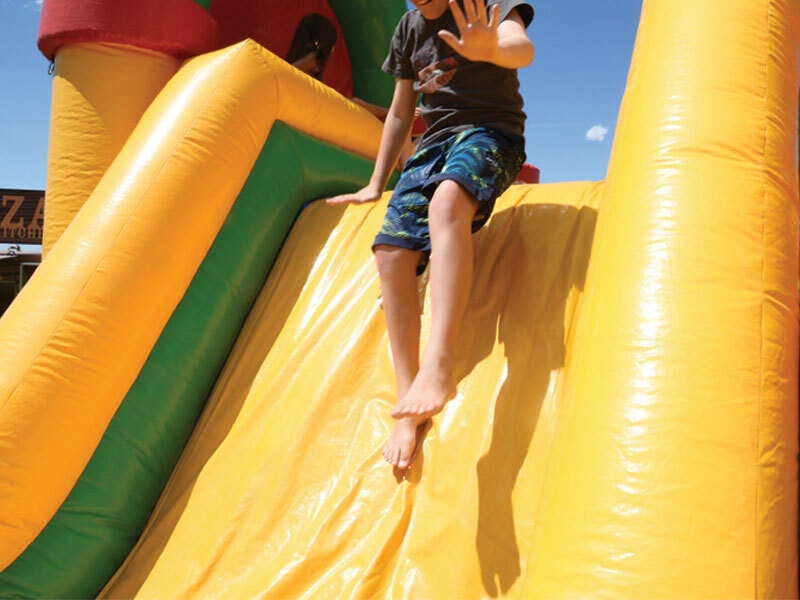 Copperleaf Summer Series – Weekly events all around Copperleaf for kids and families to enjoy all the wonders of Copperleaf in the Sun. Popsicles at the park. Scavenger hunts. Bouncy Houses. And much more. Regularly scheduled New Homeowners meetings and other information gathering opportunities for Copperleaf residents about the Copperleaf development and surrounding growth. Hosted Craft shows, National Nights out and more. Visit www.copperleafhoa.org to learn more about all they offer. Join a club. Attend and event. Celebrate with neighbors and friends. That’s what Copperleaf is all about – bringing the community together and having fun.